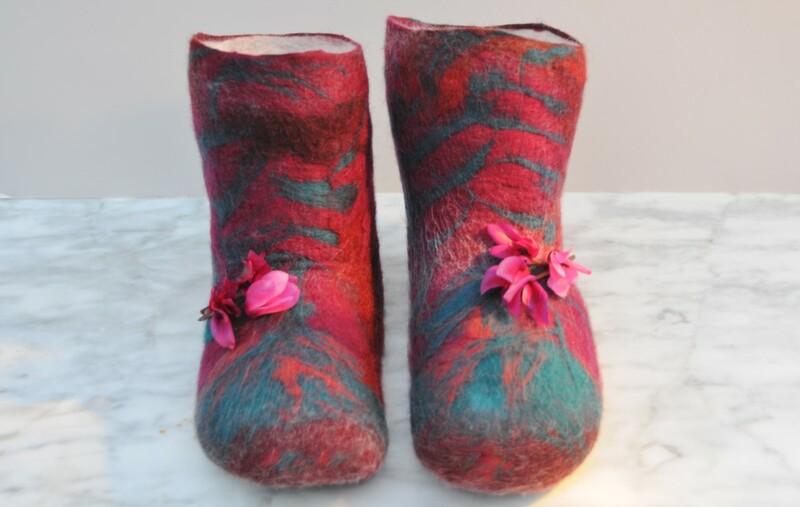 Felt making is traditionally a long and laborious process. It can take many hours to produce just one item. 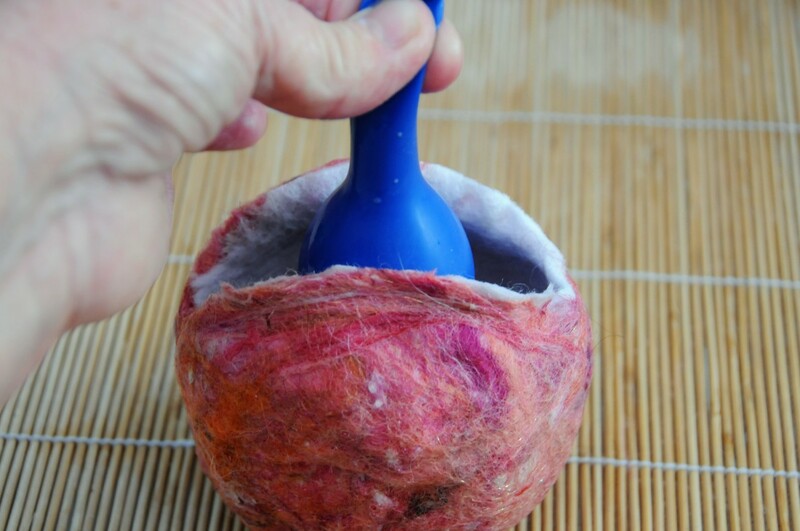 This tutorial features only one item but this can be multiplied many times over to make felting in a tumble dryer more energy efficient and cost effective. 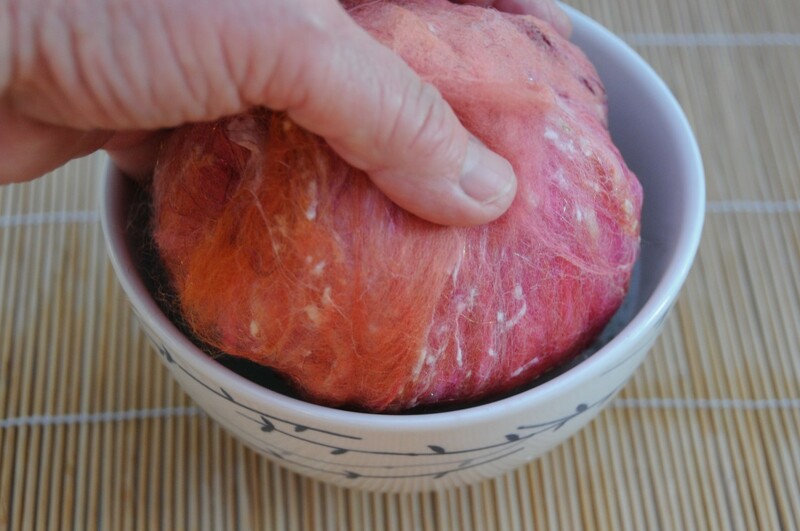 Tumble dryer felting eliminates almost all of the process of rubbing and rolling which is associated with felt making. 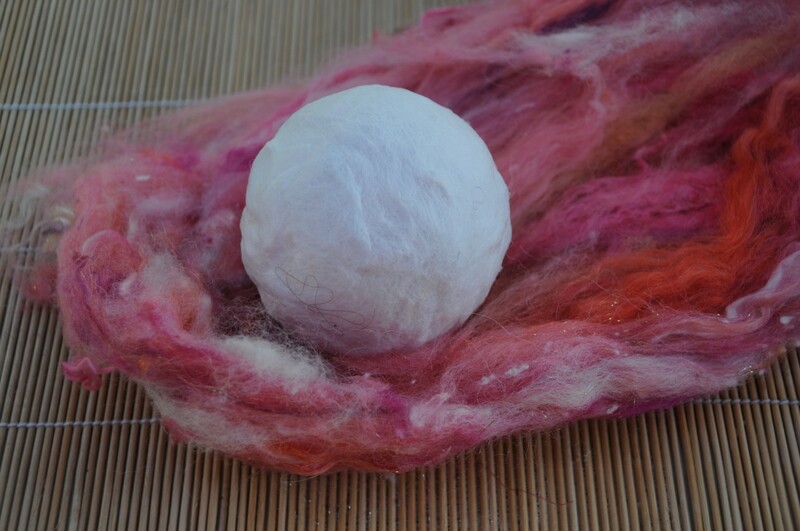 Add a few wool Batts to the mix and these too will help shorten the time it takes to cover the polystyrene balls in fibre you may even find time to make a batch of bread buns as I did while I was waiting for the felting process to be completed. 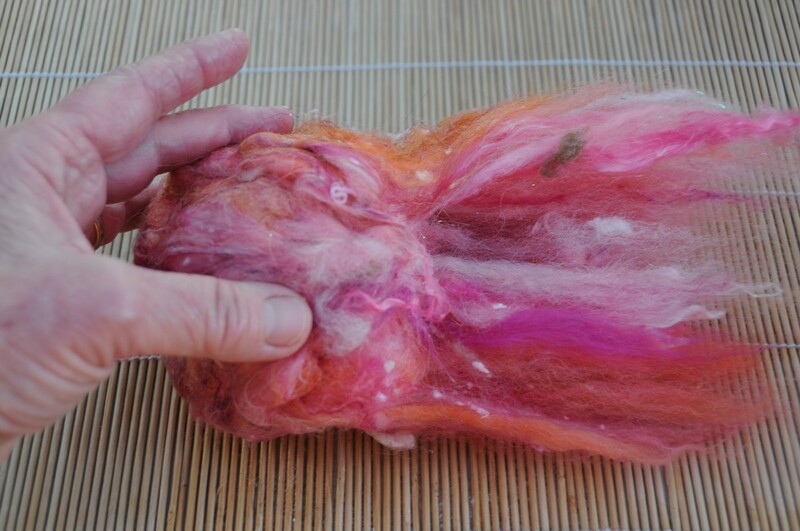 A drum carder is used to make a wool Batt. 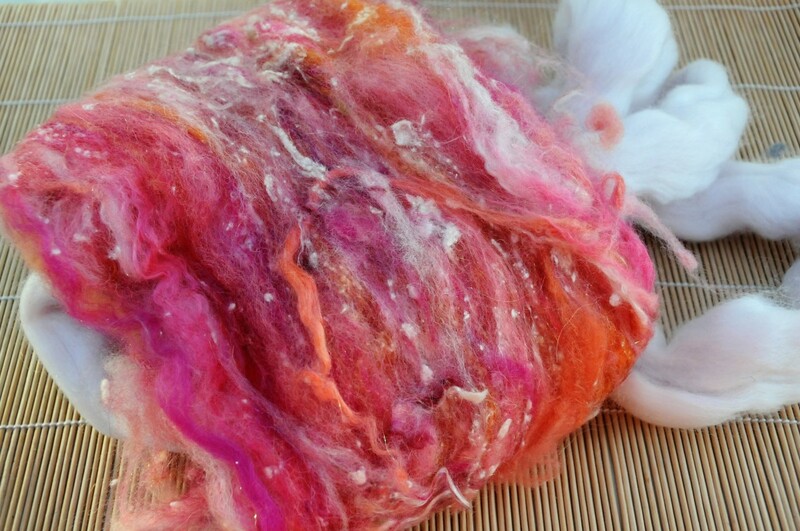 Working with a Batt is a bit like working with a blanket of Fibres. 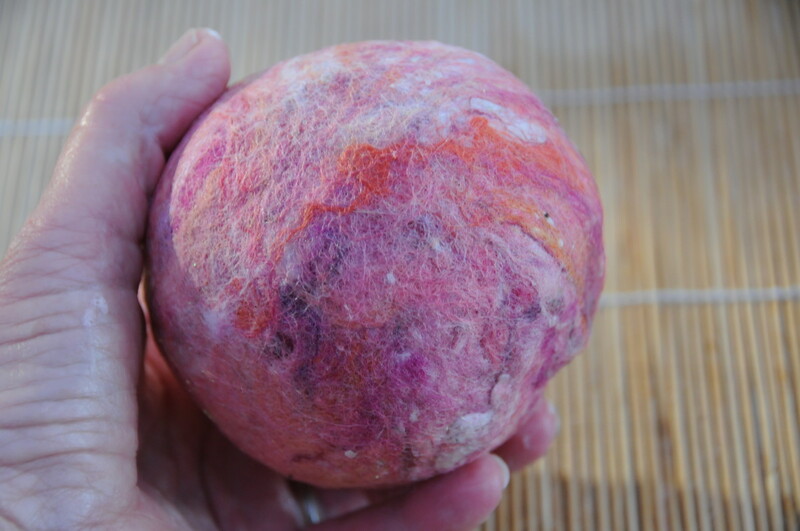 In a Batt, you will find several layers of Fibres which all lay in different directions. Most will be similar to the ones which were used in this Tutorial. 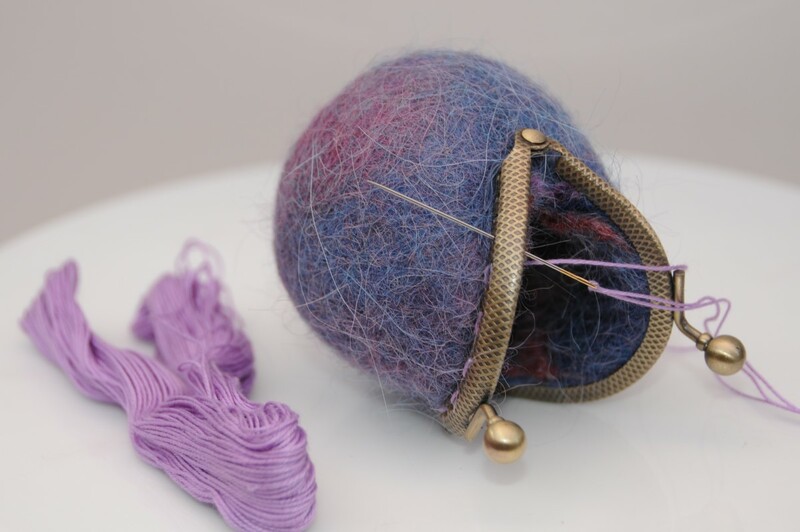 The Batts used in this Tutorial consisted mainly of Merino wool, Silk threads and a smattering of metallic thread which leave a delightful sheen when the item was held up to the light. 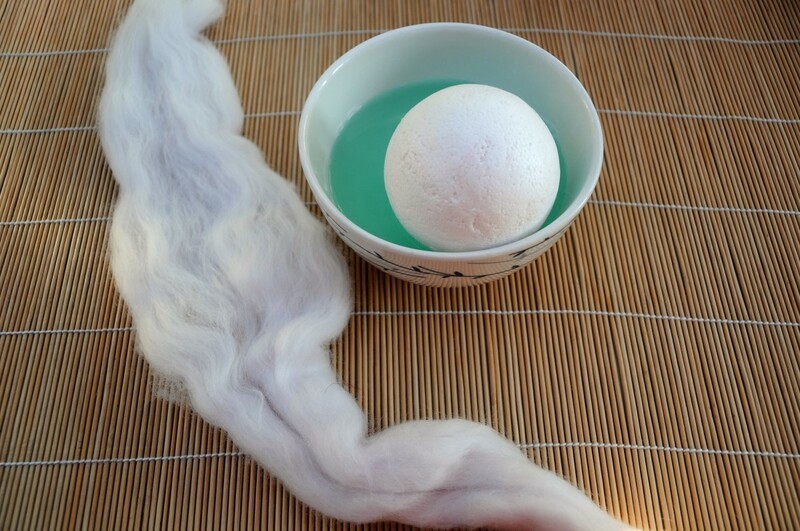 A wool Batt really does make the process of laying down the Fibres very simple! Flat projects are a breeze and so too are projects which can be made just like this one. If you want to increase productivity and save time and energy this is definitely the way. 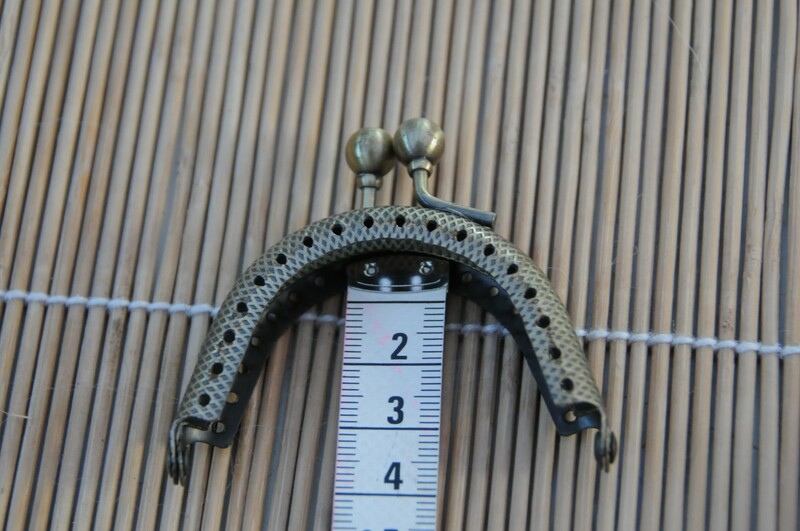 1 - 10 Metal Coin Purse Frames in Bronze or Silver (Please view images below for help with sizing. 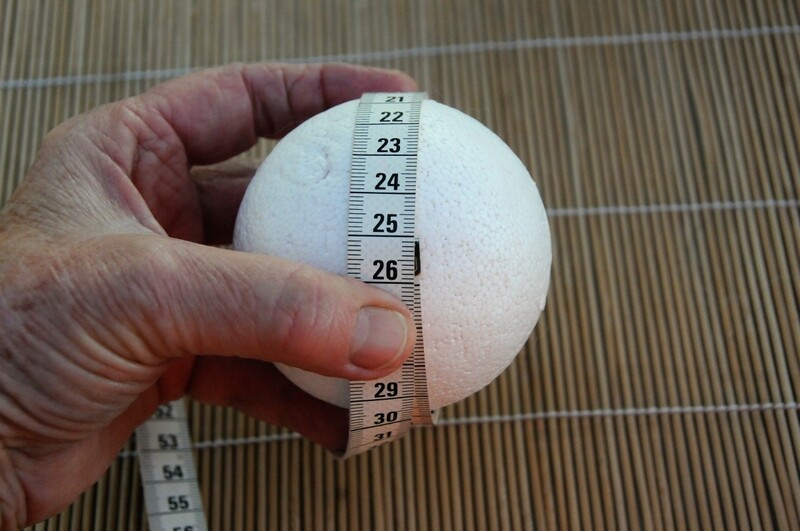 The large Polystyrene Ball will be used to complete this Project. 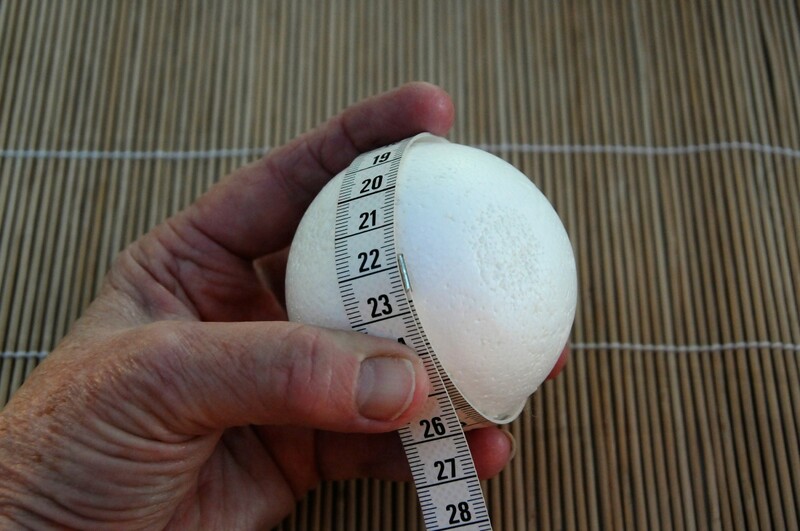 The small Polystyrene Ball is just an example of how small the finished Project should look after shrinkage has taken place. Add a dash of washing up liquid to the half filled bowl of hot water and stir. 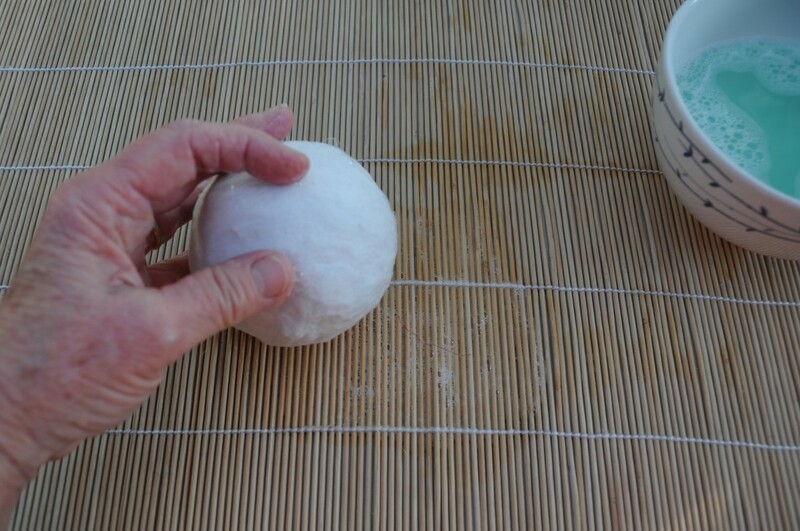 Wet the surface of the Polystyrene ball by placing it into the water and swill it around. 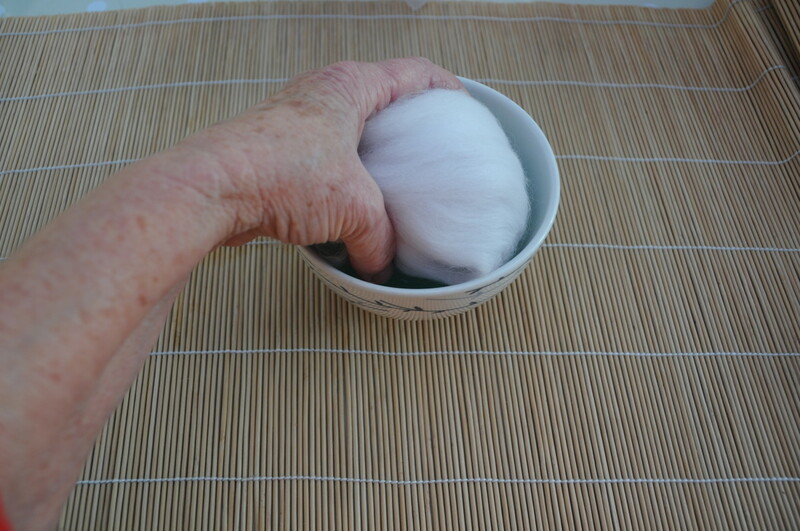 Use your fingers to open up a length of White Merino Wool Roving as shown below. Use your own choice of color for the underneath layer. Don't make the underneath layer too thick or you may have difficulty in getting the felt into the Kiss Frame when the item is completed. 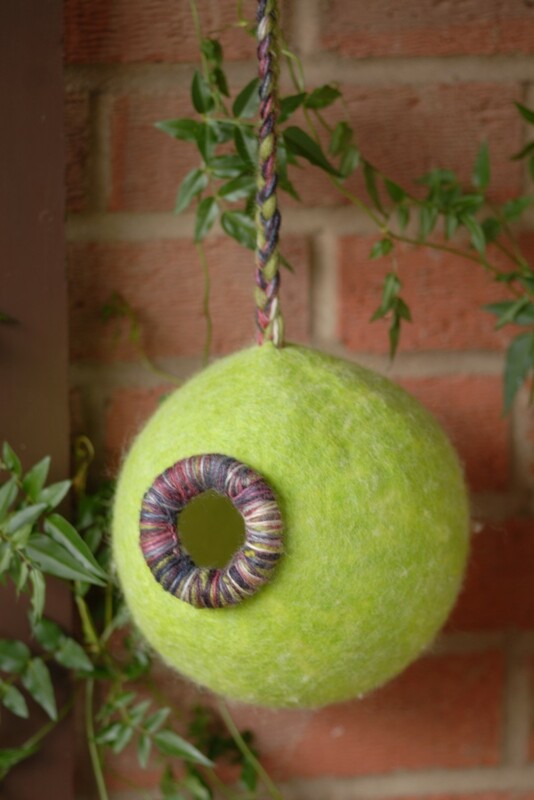 Completely cover the Polystyrene Ball with white Merino Roving. 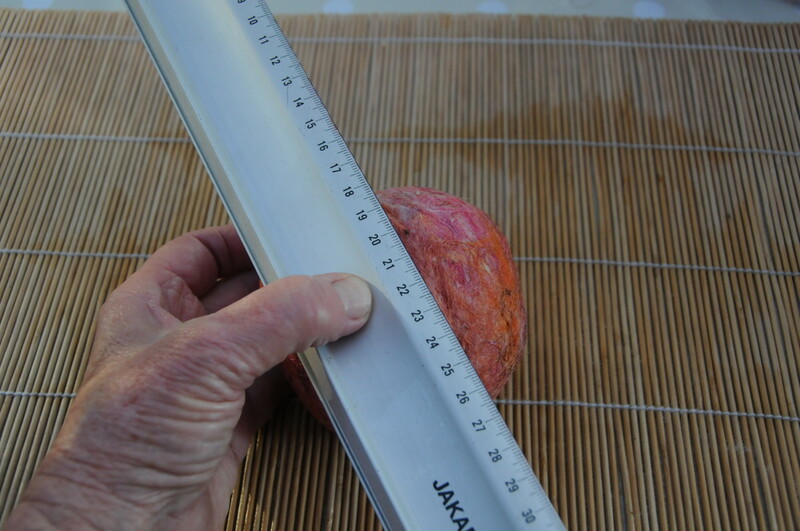 Take care to make sure that the layer is even and that none of the Ball below is showing through. 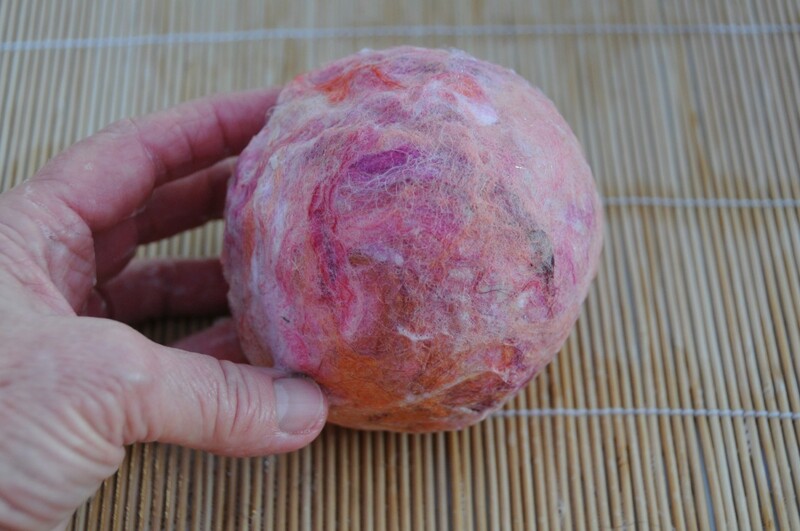 Dip the Ball into the hot soapy water and use both hands to compress the fibres against the Ball. 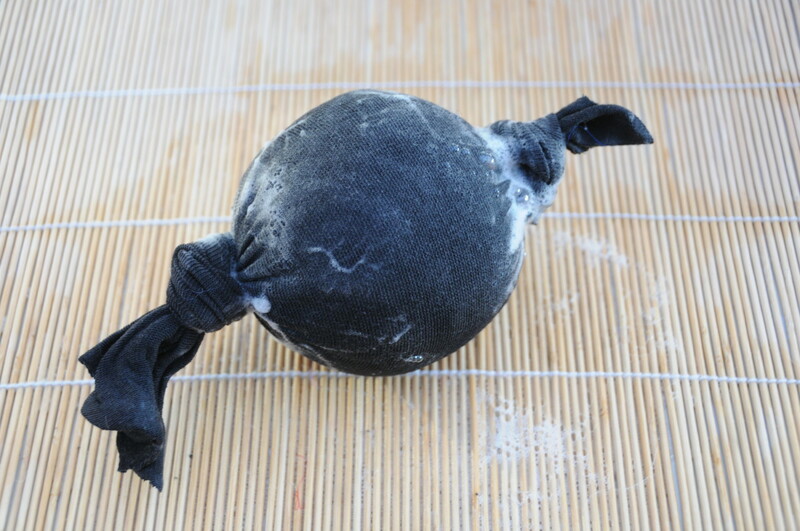 Tear a piece of wool from the Batt making sure that it is large enough to completely cover the surface of the ball with one piece if possible. Wrap the Batting firmly around the ball. 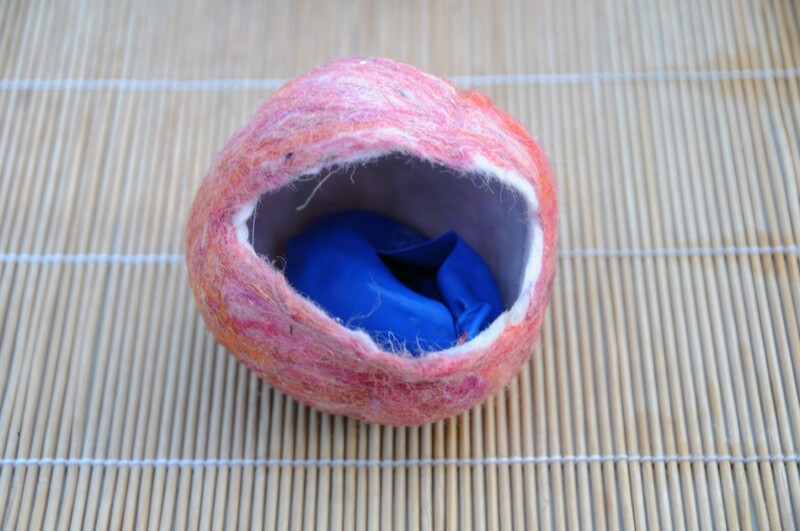 Make sure the Ball is firmly encased and neatly wrapped, with no white wool showing through. 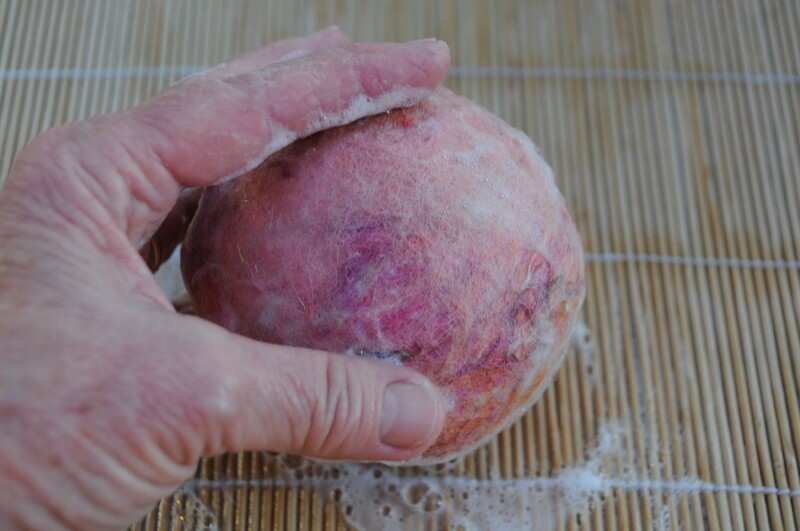 Dip the Ball gently into the hot soapy water and use your hands to compress the wet fibres down against the ball. 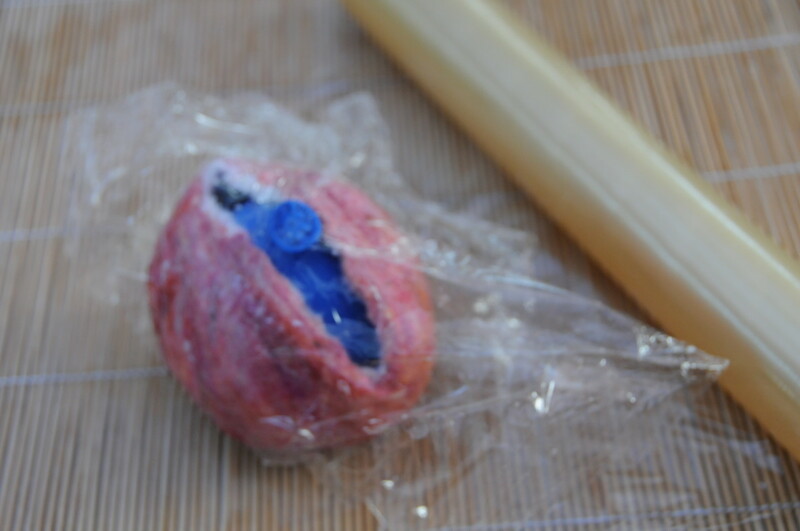 Roll the ball gently on the bamboo blind until you have a nice smooth surface. Pull the cutoff tights over one hand. 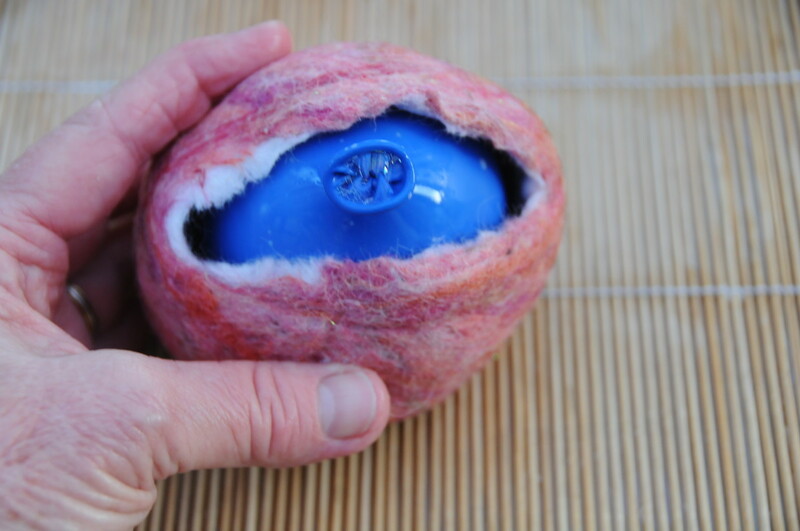 Place the Ball on the stocking and pull the fabric over the ball. 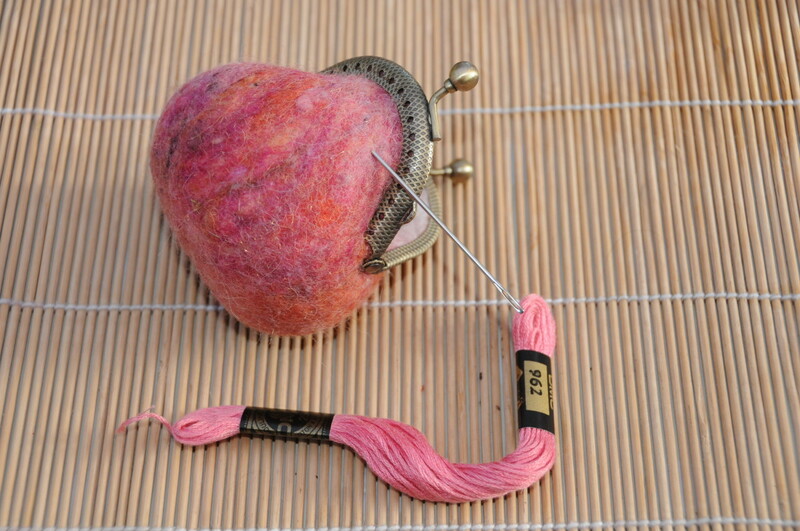 Use a slip knot to tie each end so that the contents can easily be inspected when they come out of the tumble dryer. 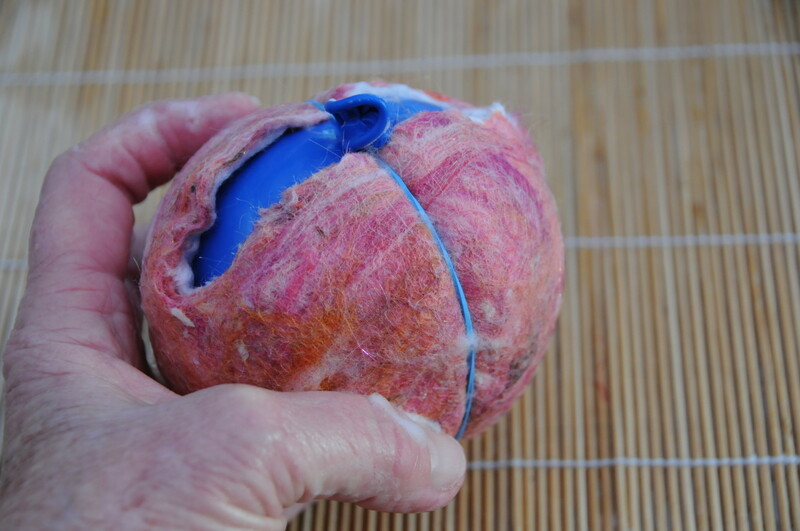 Put the ball into the Tumble Dryer and allow it to tumble for about 5 minutes. 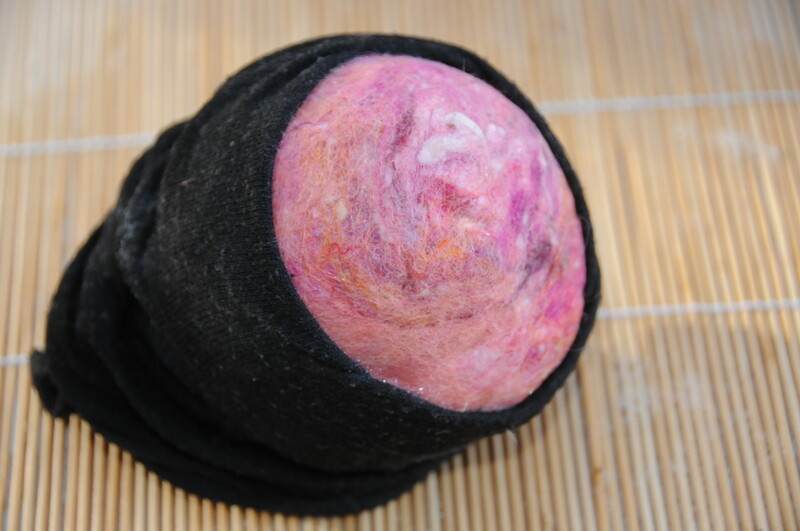 Check the contents of the tights and if the ball appears to have firmed up enough to remove the tights, do so now. If not put it back in for a few more minutes but no longer. 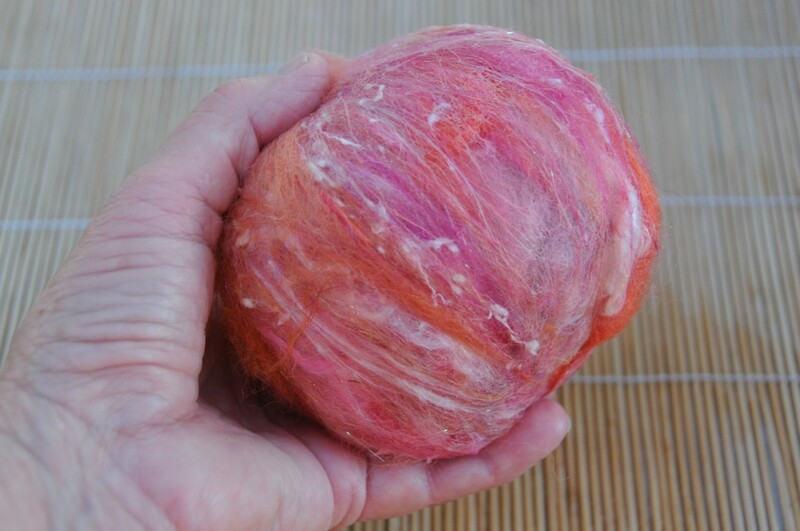 Don't leave the ball in the dryer too long as the fibres may attach themselves to the tights. All is not lost however if this does happen. Simply peel the tights off and continue with the Project. Take the tights off after a period of about 5 minutes. 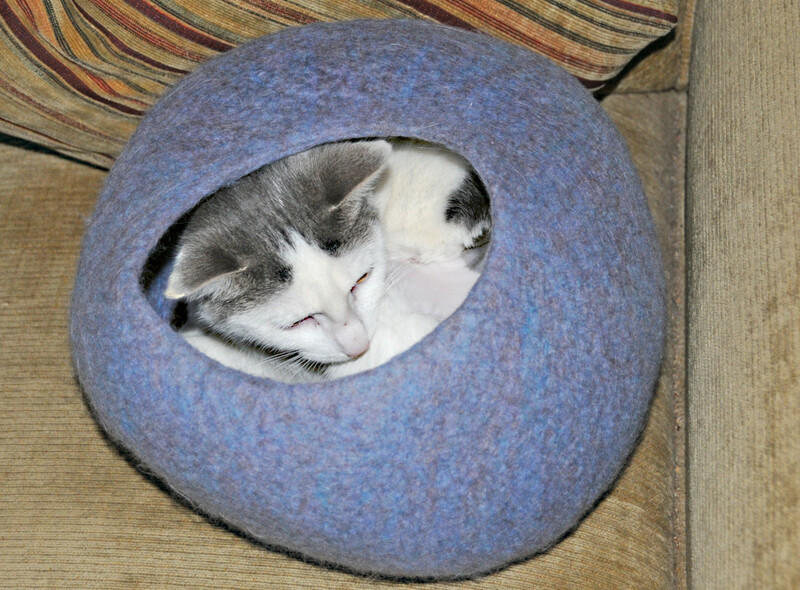 The wool will not be fully felted at this stage. Step 14—Draw the Cutting Line! 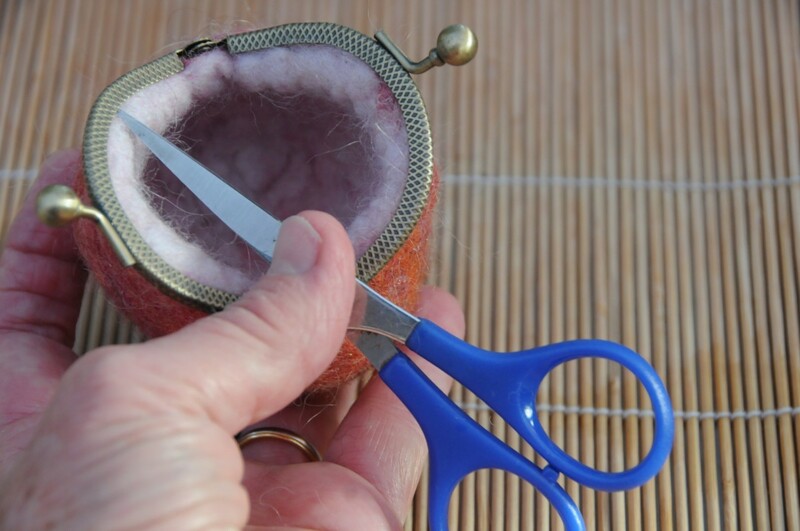 Draw an opening at the top of the coin purse and then cut it. 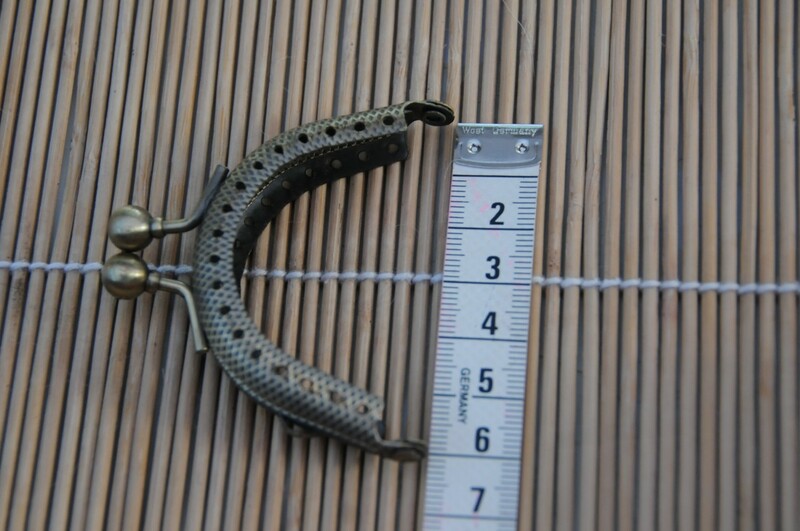 The estimated size should be around 5 cm. At this stage, the ball can be gently be eased off. Cut the opening a little if the entrance is still too tight. It is better to have a hole which is too small than a hole which is too large. You can always cut it later if it is too small. 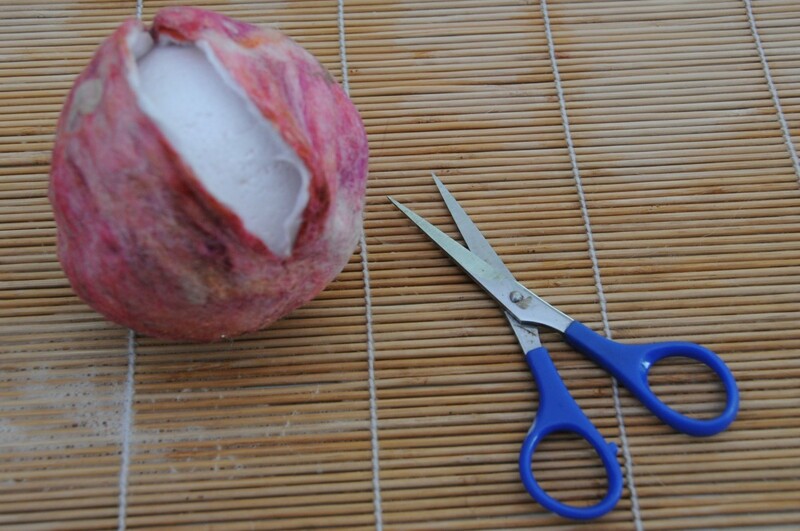 Cut the opening carefully with the sharp scissors. 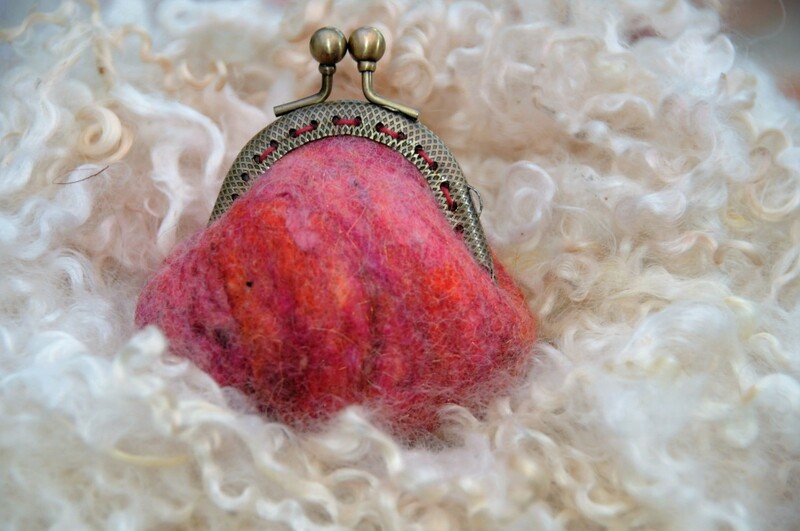 The purse will only be partially felted at this stage. It is now time to shrink it to the correct size. 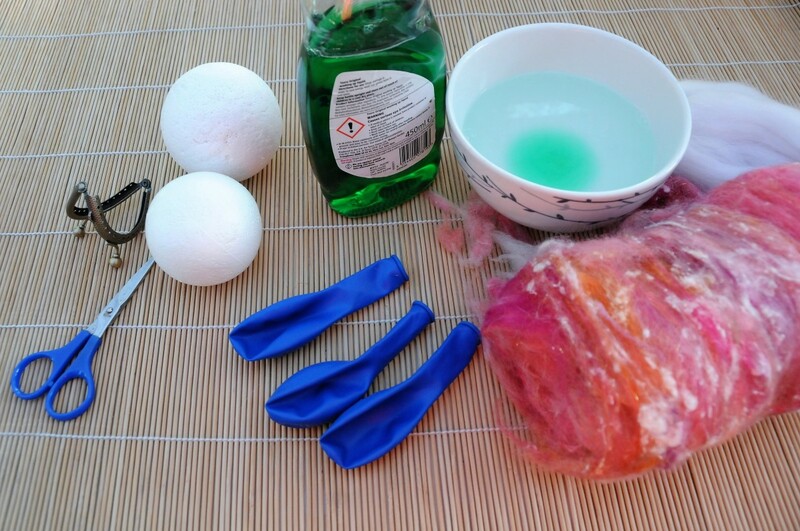 Add a little water to a party balloon. The water should only fill the small bowl end of the balloon. Seal the water and air filled balloon and knot the end when enough air has been added to almost fill the cavity of the purse. 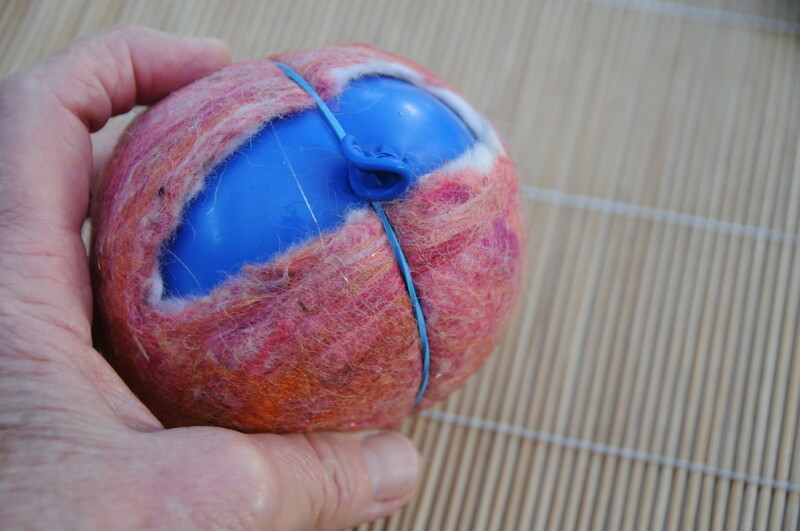 The idea is to leave a gap on all sides which will allow more shrinkage to take place between the felt and the party balloon. I like to add a little water to the balloon as it adds weight to the project. 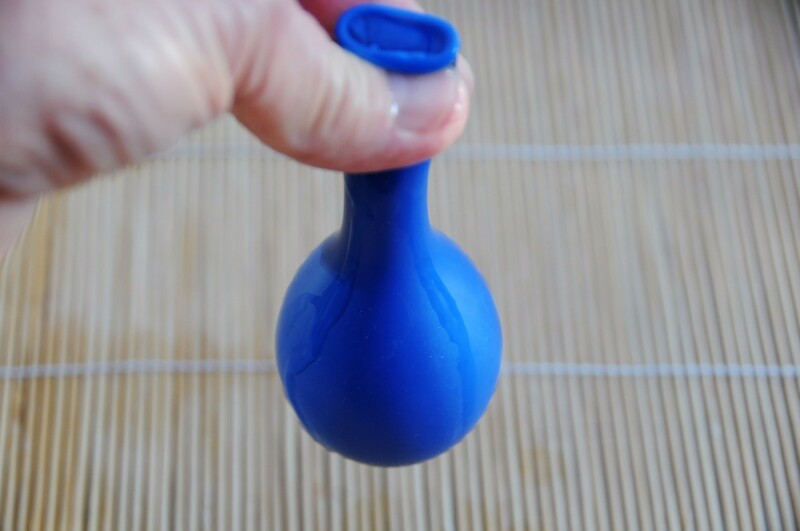 If you don't add water to the balloon the hot air expands too much and the result will be a purse which has an opening which is too large for the kiss frame. 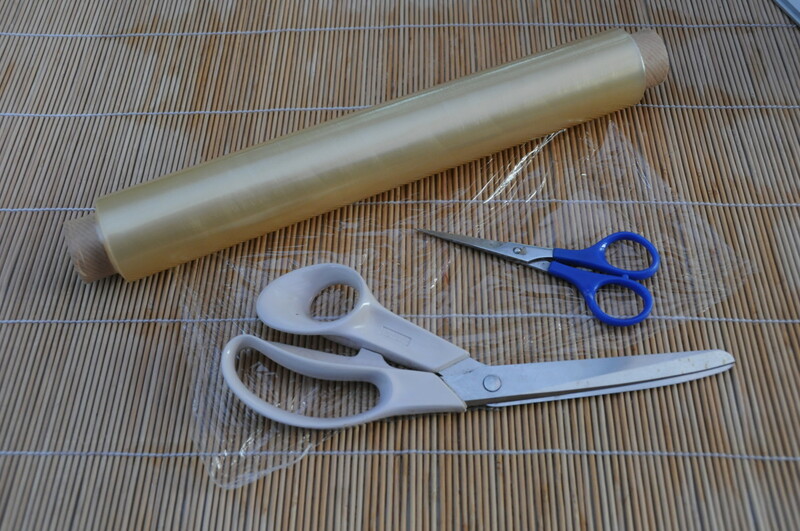 You may wish to use cling wrap to secure the balloon instead of the elastic band. The wrap works surprisingly well even when it is placed inside a hot tumble dryer. 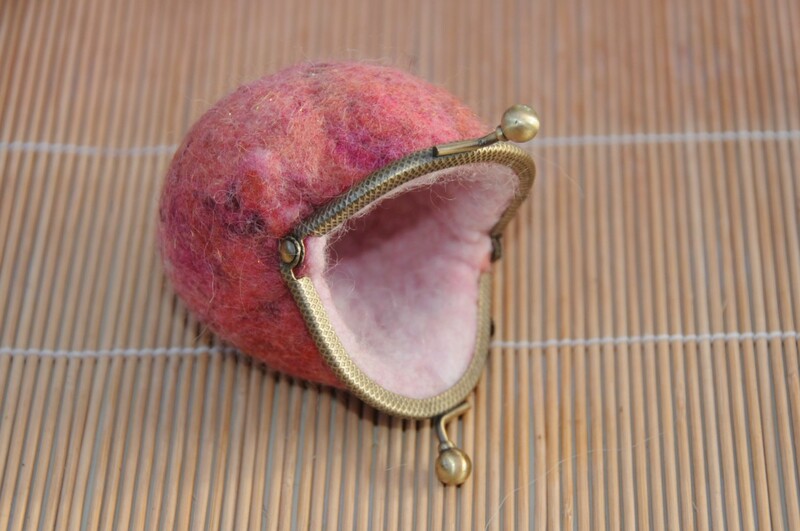 Remove the purse from the tumble dryer after 5 minutes. You will notice that there is no longer a gap between the party balloon and the purse. 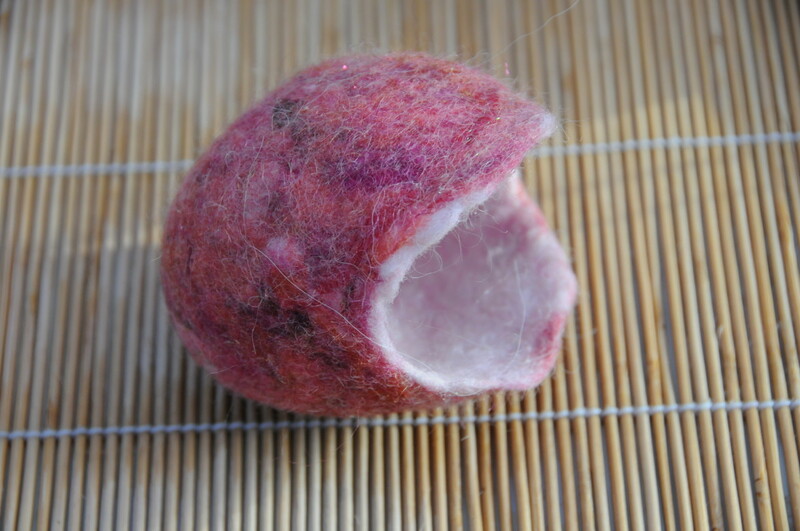 Further felting may be required to get it to the size of the small ball shown above. 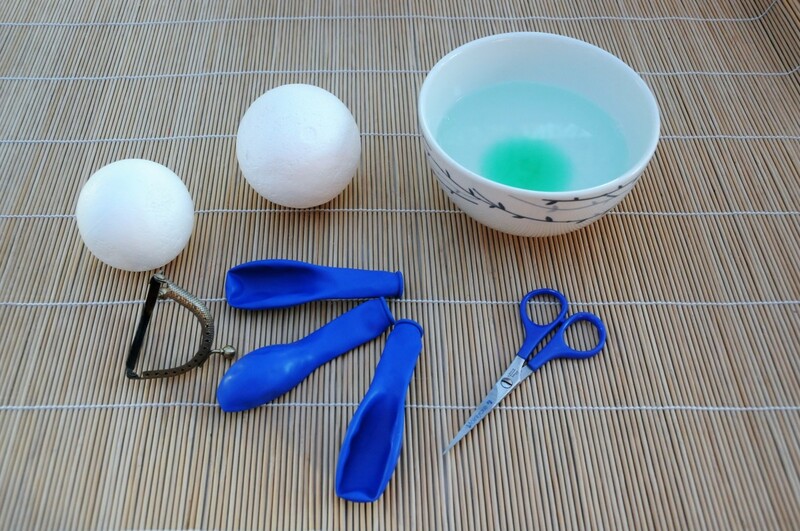 Pierce the Balloon with a sharp pair of scissors and pour out the excess water. These adorable Metal Kiss Frames shown above can easily be purchased from Amazon. They are the perfect size to complete this Project. 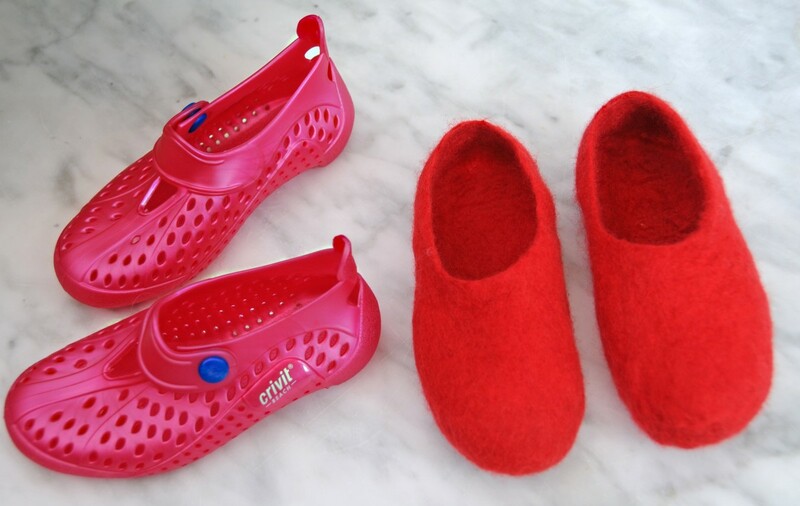 Sew them on with matching embroidery thread and a sewing needle to complete your project. 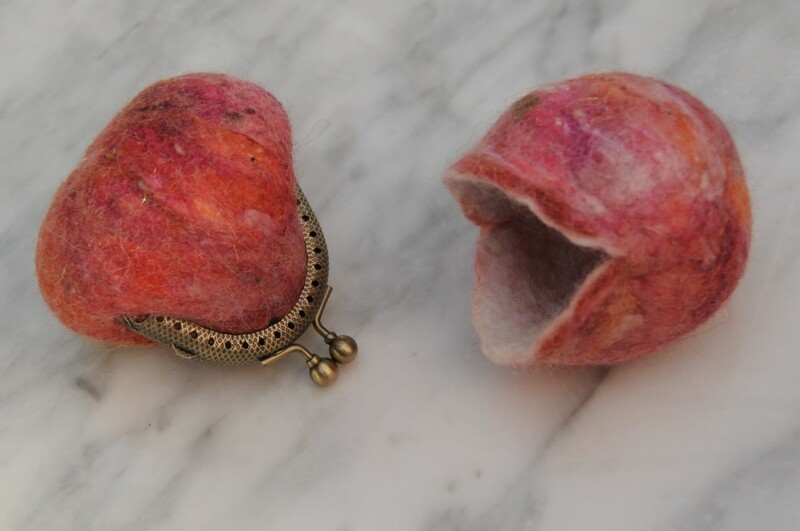 Use a small pair of scissors to ease the fabric into the little metal lip as shown below. Sew on the Kiss Frame using matching or contrasting embroidery thread. 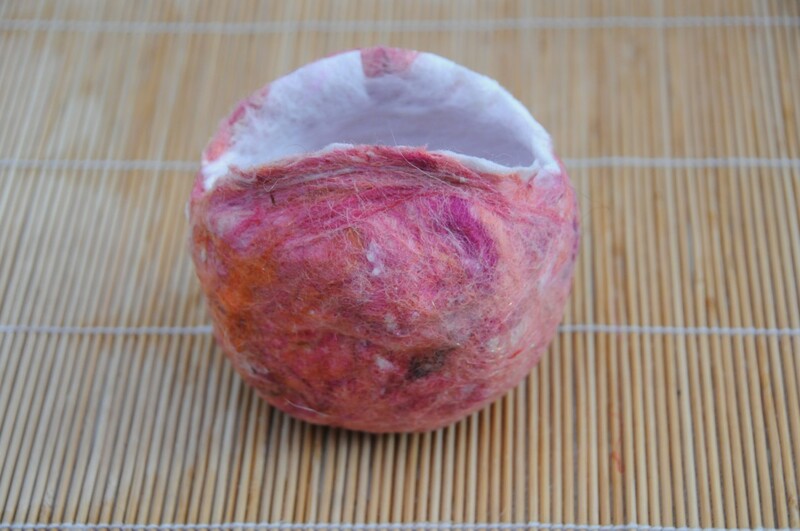 Would you be interested in seeing more Projects which can be made inside a Tumble Dryer? I crocheted a long bag which I want to fold into itself to make a reversible bag. Can I do this in the dryer? Will it felt together if I don't put something in the middle of the bag? 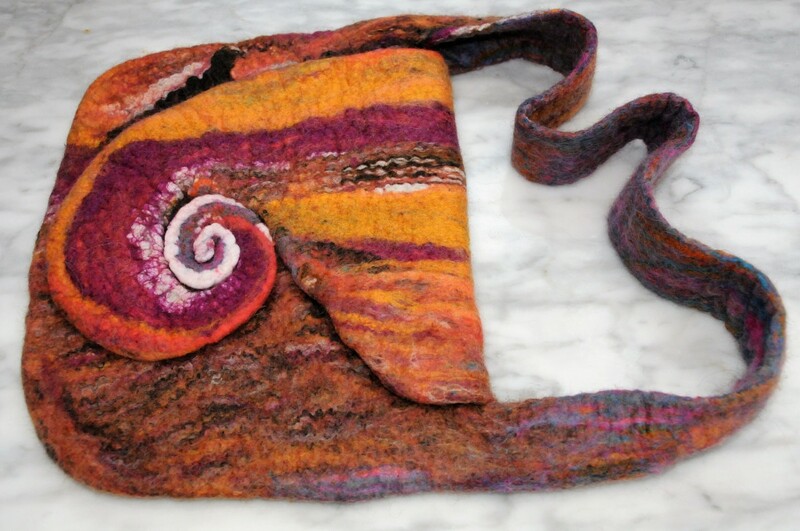 If you crocheted a bag using knitting wool and not wool roving, it may not felt it at all! 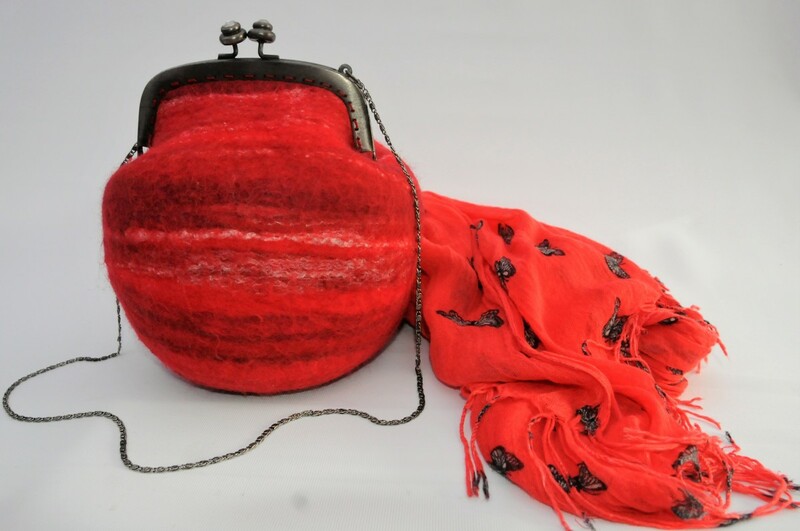 It all depends on the type of wool which you used to crochet the bag. 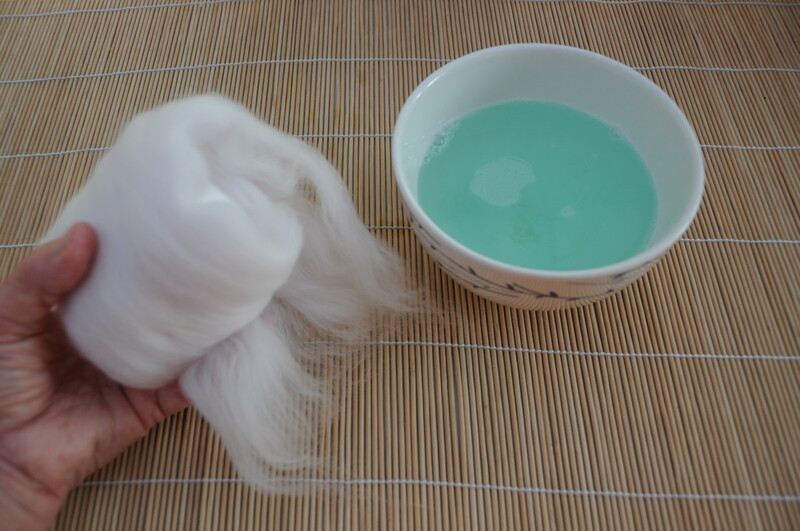 If it is pure wool, it will felt but is unlikely to if the wool is synthetic or if the synthetic content is too high. 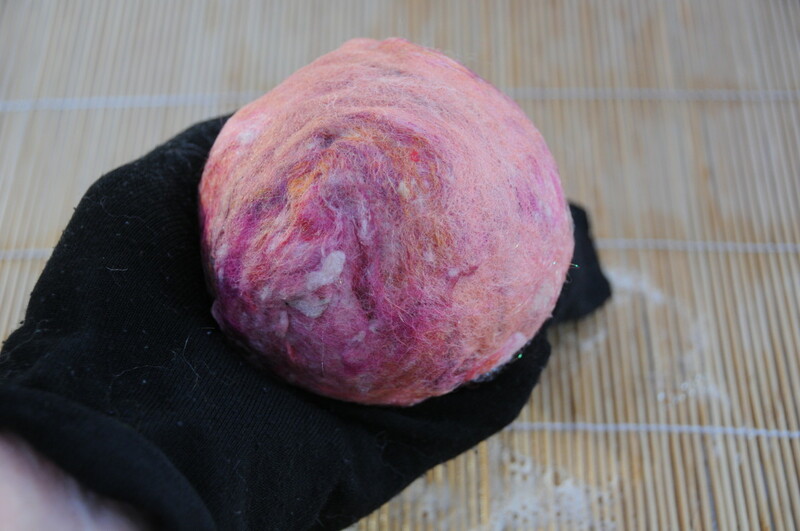 If I am wet felting with wool roving, I start off with the template still being inside the project during the early stages and remove it when the wool begins to felt properly. Always keep a careful check on the contents of the dryer to avoid shrinking the project too much. 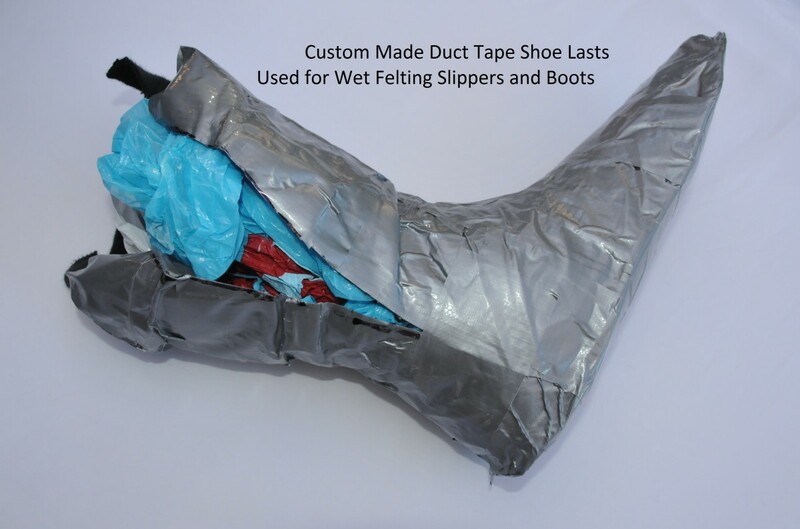 I would insert a piece of floor laminate underlay, bubble wrap or even cardboard inside the project to be on the safe side. Marie that is nice to know. I hope you do realize that this art form can be addictive:) Enjoy! Wow, i'm not a felter but you might just gave me the "Humph" for trying. Very lovely purse ! Congrats! Go for it Pippa, hope it goes well. Wow! Thank you, going to fix the plug on my dryer specifically for this project! Glad you like the purse. Thanks for the positive feedback. It is much appreciated. 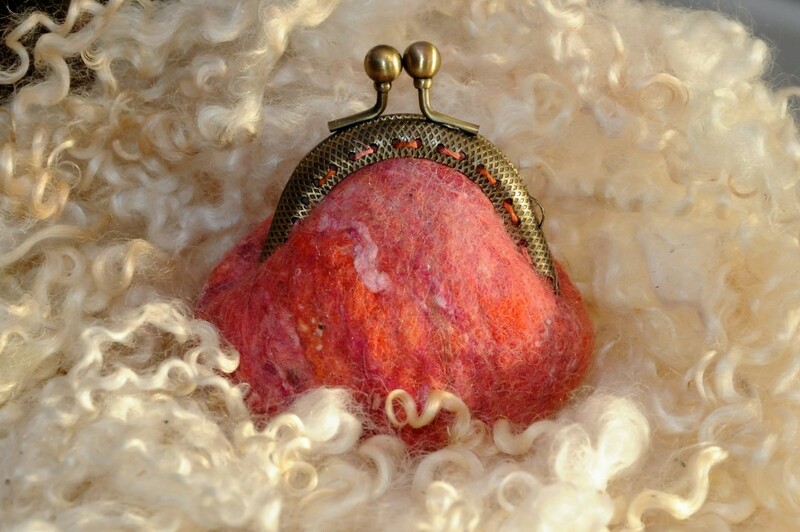 Adorable purse, Sallybea. I love the colors -- beautiful photography, too! No, the felt is still wet after the fist 5 minutes and also after the 2nd 5 minutes. When you pierce the balloon it tends to get wet again and really it is to your advantage as it makes the felt easier to work with. Thanks for the comment, that helps everyone else:) In fact, I wrote that info in and then wrote it out:) I appreciate your stopping by as always. Happy Sunday. Great tutorial, Sally! I was wondering - when the purse body comes out of the dryer, is it still malleable so that you can adjust the shape a little? Maybe make it more oval or something? Or is it completely dry and set? Thanks for sharing this beautiful project! Not sure how you do it but you are nearly always the first to comment and you are not even a Felt Maker Billy:) Well, that is not yet:) I might make you one yet. Thanks so much Billy, hope you and yours are having a Happy Sunday too. Anyone interested in writing a craft article would do well to pay attention to your articles. They are clear, concise, their pictures are helpful and of high quality.....another excellent how-to article, Sally! Well done, and Happy Sunday to you.